You are about to read a newspaper article. Do you care whether all the facts in it are true? If so — what could convince you that they are or are not? A friend? A neutral website? Someone in authority? If you aren’t really sure, then welcome to the world of fact-checking. In the past several years, as it has become easier to spread misinformation and conspiracy theories on the Internet, politically neutral fact-checking websites have sprung up in response. The Post itself created an early version, the “Fact Checker” column, led by Glenn Kessler, which awards up to four “Pinocchios” for dubious statements made by politicians from both political parties, depending on their level of outrageousness. Others include PolitiFact.com, FullFact.org in Britain, Chequeado in Argentina and StopFake.org in Ukraine. All of these organizations have had real successes. Chequeado played a major role in the latest Argentine election. StopFake has helped both Ukrainians and outsiders understand the degree of Russian media manipulation in their country. Former Republican presidential hopeful Jeb Bush once spoke of not wanting to be “PolitiFacted” for getting things wrong. Nevertheless, there are limits to what fact-checking can achieve. Those who have tried to measure the impact of fact-checking have found that there are many kinds of audiences, and that fact-checking affects each of them differently. All people are more likely to believe in “facts” that confirm their preexisting opinions and to dismiss those that don’t. But those with unusually strong opinions — those who are more partisan — are less likely to change their views, more likely to claim that fact-checkers themselves are “biased,” and even more likely to spread their views aggressively to their friends. This has always been the case, but social media now multiplies the phenomenon: In a world where people get most of their information from friends, fact-checking doesn’t reach those who need it most. These may sound like philosophical questions, but in the campaigns of 2016, they are beginning to loom larger as a problem for democracy itself. Exhibit A is Donald Trump, who lies repeatedly and is fact-checked repeatedly, with no noticeable impact on either his own behavior or that of his supporters. Britain’s European Union referendum campaign is also plagued by deliberate misuse of facts. 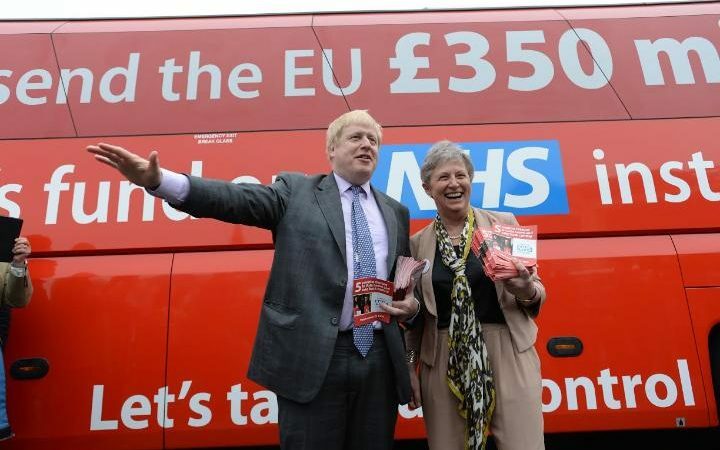 Over and over, the “Leave” campaign refers to the 350 million pounds ($511 million) that Britain supposedly pays to the European Commission every week. Over and over, that number is shown to be fiction, by InFacts.org (whose editorial board I am on), BBC Reality Check and others. The number remains painted on the side of campaign buses, and nothing changes. These problems aren’t exactly new: The question of what is propaganda and what is truth has plagued politics since politics began. But the nature of information in the social media age means it keeps getting easier for politicians, partisans, computerized “bots” and foreign governments to manipulate news, and it keeps getting harder to correct this. Fact-checkers are, for the moment, one of the best solutions. But they work only for people who want them to work, and that number may be shrinking. Anne Applebaum: Trump’s campaign brings Eastern Europe’s political ‘tactics’ to the U.S.